Last full day at Corsham Library in Pickwick Road for Sarah, Chris and Sue who have given sterling service here for, respectively, 6, 26 and 24 years. The library has relocated to the Community Campus in Beechfield Rd. 8th December 2017 - great news ... Jaipur has returned in takeaway form next to Tong's fish and chip shop in the High Street with free delivery on orders over £25 to Corsham and surrounding villages. What a Christmas present for Corshamites! Their phone number is 01249 701000. Outraged - I should say. First of all, the royal box wasn't available for Lord and Lady Turner of Rudloe. Then, the writer, director, actors, musicians, designers, engineers (and the rest) make me sick - they have so much bloody talent! And lastly, the plebs of Corsham can't be arsed to turn out to the Theatre on the Doorstep (only twenty-odd in an auditorium that holds about a hundred). Modest Theatre Company make dark, physical comedy about social taboos. This performance is based on the true story of Tess Cartwright (who devised the piece) and Vid Warren and their journey through Vid's brain cancer and his passing. Sounds heavy eh? But this was at the same time tragic, hilarious and as with much of the work at The Pound, some of the best theatre we have seen, anywhere. "Vegetable biriany, aloo gobi, begun bhaji, nan, papadom ..." and the end of an era. Mr Rahman, the proprietor, opened the Jaipur in 1987 after running a restaurant in Westgate Street, Bath for a number of years. He and his former High Street neighbour John Burrett who ran Autobits (John passed away in 2014 - see 'Localities', 'Corsham & Box shops etc') escaped the rising rents of Bath city centre in the late 80s to establish their businesses in Corsham. With John's demise and no one willing to establish a Jaipur dynasty, Corsham has lost two significant High Street presences. As indicated in the 19th February article, the restaurant will now shift cuisines ... to Chinese. The new proprietors already run an apparently successful concern in Chippenham. Locals are distraught at the news - I've even had people knocking on the door with "Did you know ...". Funny old game but we have been using Jaipur since its opening in the 80s and we still don't know the proprieter's name! The repartee is more important than names though ... "How are you?" he says. "Just suffering from old age and poverty" I say. "You're not as old as me" he says. He's 82 and taking a well-deserved retirement. It is however a great pity that none of his children or grandchildren is willing to take on the restaurant as they are all more than capable and have the expertise and personality to make a great go of it. We may discover the actual closure date tomorrow, 20th February, when the parties involved in the transfer of power from Bangladesh to China will be exchanging documents. Let's hope that last night's takeaway won't be the last and we will be able to enjoy another meal or two before the actual closure. Where now though? Looks like it will have to be Rajpoot* in Bath but that's nowhere near as convenient as the short hop to Corsham (* I have been informed by a reader that Rajpoot closed on Christmas Eve last so we have a double whammy!). Townsend Productions were taking bit of a chance here, bringing this union-sponsored, working class play to the fringe of a constituency that has been Tory since the demise of the Liberal Party in the 1920s. So, the theatre was only half-full and I believe that a good number were card-carrying Labour voters. Any road up, I wouldn't go as far as the "tremendous" of the Times critic but this two-man show, which was written by and starred Neil Gore, brought a view of life and of history not much aquainted with in these parts. The script was unrelenting - how these guys, particularly David Heywood who took the role of the Dare Devil, remembered their lines is beyond me. The Dare Devil was Clem Beckett, a speedway star and a Communist who "Saw the fight in Spain as part of the fight of the British workers". Clem went off to Spain and joined the British Battalion of the International Brigades. He was killed at the Battle of Jarama on 12th February 1937. 31st May 2016 - wandering in the Wiltshire Cotswolds. The back cover of The Wiltshire Cotswolds by Ken Watts describes this area as a "fascinating and attractive region which extends from Bradford-on-Avon through Corsham, Sherston and Malmesbury to Cricklade in the north". Finberg wrote: "The fine school of stone-working craftsmen who rebuilt manor houses also carried out a wholesale reconstruction of the villages and market towns. From 1570 onwards they built thousands of new farmhouses, cottages and barns. It was in this period that they evolved what is usually known as the Cotswold style. In reality the style was common to the whole belt of oolitic limestone from Dorset to Lincolnshire; but in the Cotswolds it attains its highest degree of regularity and grace". From his home in Langley Burrell (just outside the Wiltshire Cotswolds) Kilvert wrote: I love to wander on these soft mournful autumn days, alone among the quiet peaceful solitary meadows, tracing out the ancient footpaths and mossy overgrown stiles between farm and hamlet, village and town, musing of the many feet that have trodden these ancient and now well nigh deserted and almost forgotten ways and walking in the footsteps of the generations that have gone before and passed away". Well what of the Wiltshire Cotswolds today? Our governments whilst preaching that local decisions would be extended to local people, have done the exact opposite and allowed the country to fall prey to speculative developers. No matter that such action would despoil a "fascinating and attractive region". This would be a great joke if it wasn't so true. Our fascinating and attractive Cotswold region will simply become, as he or she says, another Slough, a dormitory or satellite conurbation serving towns outside our region, towns such as Melksham, Trowbridge and Chippenham where most locals already work and do their shopping. Again quoting (see article elsewhere) from Ted Nield's Underlands the governments' (this and the last) "bungling ineptitude" is echoed through the Planning Inspectorate and Wiltshire Council planners ... "men charged with tasks for which they were totally unfitted ... men led astray by foolishness or by ignorance, or by both in combination". Another appropriate slough would be the slough of despond felt by local people with regard to the despoiling of Corsham by speculators, landowners, Government, Planning Inspectorate and Council planners. Christian's despair is evident in this illustration from an old version of Pilgrim's Progress on my bookshelves. Speaking of Corsham, Pevsner wrote: "Corsham has no match in Wiltshire for wealth of good houses. There are in fact no bad ones, and there are a few or really high merit". I wonder what Pevsner would make of the insufficient (Britain builds the smallest new homes in Europe), standardised, 'toytown' estates with hardly any garden space and narrow roads and garages already built and proposed for the west Corsham conurbation? But not only that, 21st-century planning decrees require monolithic commercial or business blocks to be built alongside these estates. Inevitably this will be seen as bungling ineptitude by the next generation of planners as it is by us mere plebs now. Unfortunately playing to a paltry audience, Breach Theatre brought their re-enactment of the 1985 'Battle of the Beanfield' to Pound Arts Centre on Easter Saturday, 26th March. The events of 1st June 1985 are chilling. This thought-provoking piece of theatre by a young company cautions that this so-called 'battle', where the police (at the behest of their political masters) used shocking violence against young families, should not been forgotten. Nor should it be.This was not a battle but rather a premeditated vicious assault with bullying and intimidation by an armed, marauding mob. Many or most of the festival-goers' vehicles (their homes) were smashed or torched. The police operation and subsequent legal proceedings cost the taxpayer, or more likely the Wiltshire ratepayer, an estimated five million pounds. Links to YouTube videos, which include much footage including ITN reports (where the reporter appears shocked and shaken), are provided below the following image from the theatre production. John, Eileen and six other victims of the Tunisian terrorist were flown back into the UK this afternoon. Some hours earlier, at noon, a national minute's silence was observed for all those killed in the massacre. Flags were flying at half-mast at Rudloe and Travellers Rest. 22nd November 2014 - insightful writing and powerful performances at The Pound - Linda Bassett of East is East, The Calendar Girls, Call the Midwife and Lark Rise to Candleford (Queenie) starred. A marvellous show with a half-empty auditorium. What are Corshamites doing on a damp November Saturday that such a piece at a local theatre plays to a half-empty house? The College authorities propose to close the Corsham Enterprise Centre after the 2014 summer term. Not much enterprise shown here by the College it seems! This is a purpose-built education centre, right in the heart of Corsham, with a dedicated computer lab equipped with eighteen workstations and three further classrooms. The centre is perhaps best described by the College website: "Our bright and airy premises in The Martingate Precinct have become more accessible than ever. A lift is available for those that cannot manage the stairs to the first floor. We offer a variety of courses suitable for beginners and experts alike." Thanks to a lack of vision and marketing (in my opinion), only two courses are being offered at the Centre: Italian year 1 and Italian year 2, both on Monday morning. For the remainder of the week, the Centre lies unused. I have written two emails to the College on the subject, the second after an initial response which I considered unsatisfactory. I copied the emails to Duncan Hames MP and Corsham Town Council. 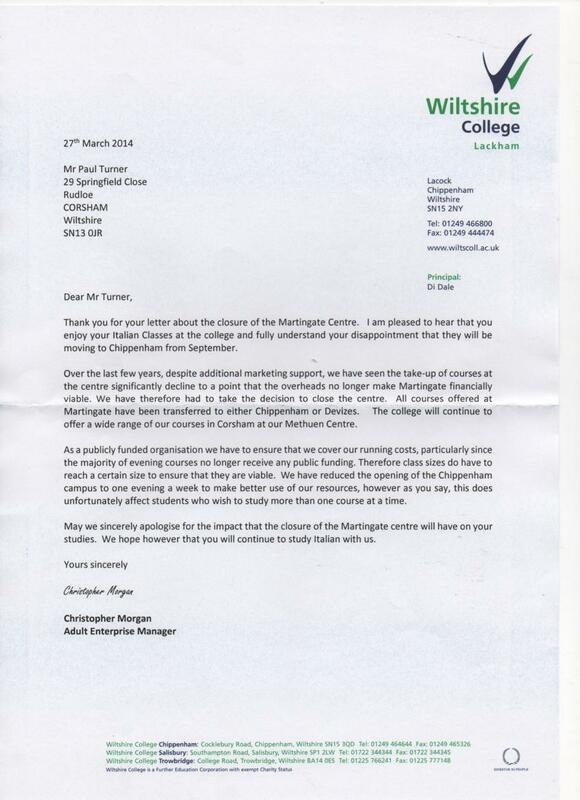 Mr Hames has, in turn, written to the College authorities. Corsham Town Council has not responded. My emails and the College response are shown in the links below.